Israel (Hebrew: מדינת ישראל; Arabic: دولة إسرائيل) is a small yet diverse Middle Eastern country with a long coastline on the eastern Mediterranean Sea and a small window on the Red Sea at the Gulf of Eilat (Aqaba). Israel is bordered by Egypt and the Gaza Strip to the southwest, by Jordan to the east, and by Syria and Lebanon to the north. It shares borders to the Jordan River and the Dead Sea with the West Bank and Jordan. Israel was established as a state for the Jewish people, following the Second World War. Israel is considered part of the Holy Land (together with areas of Jordan, Egypt and the Palestinian Territories). The three major monotheistic religions—Judaism, Christianity, and Islam—all have historical ties to the region. Israel thus contains a vibrant modern history and culture, based in part on the diverse, immigrant origins of its inhabitants returning from the Jewish Diaspora. These aspects make Israel a fascinating destination for many travellers and pilgrims. As a result of this vast mix of culture, in addition to the official languages of Hebrew and Arabic, Russian, French, Spanish, Amharic and Yiddish are also spoken by a significant minority of Israelis. English in many ways acts as second language. Within Israel's recognized pre-1967 borders, about 80% of Israelis identify themselves as Jewish, the remainder classify themselves as either as Arab and/or Palestinian, Bedouin, Baha'i, Muslim, Christian or Druze. While the current State of Israel is a relatively new country founded in 1948, the Land of Israel has a long and often very complex history stretching back thousands of years to the very beginnings of human civilization. It has been invaded by virtually every Old World empire including the Persians, Romans, Ottomans and British. (Even the Mongols once raided cities on what is now Israeli soil.) It is also the birthplace of both Judaism and Christianity. Jerusalem is a sacred city for all three of the Abrahamic religions: Judaism, Christianity and Islam. Israel has been inhabited for tens of thousands of years, with Neanderthal remains from the region dating back 50,000 years. Its strategic location serving as the gateway from Asia to Egypt and Africa had made Israel an ideal target for conquerors through the ages. The first nation to have influence was the great Egyptian civilization. Approximately 1000 BC, an independent Judean Kingdom was set up under King Saul. The land lay to the south of Phoenicia. After intermittent civil war, the land was conquered by the Assyrians and Persians and in c. 330 BC by Alexander the Great. A newly independent Jewish state, ruled by the Maccabees, was conquered in 63 BC by the Romans. Jesus of Nazareth is said to have began his ministry in the Galilee around 30 AD. Following a Jewish revolt against the Romans in AD 70 , the Israelites were expelled from Jerusalem by the Romans, creating a substantial Jewish diaspora throughout the world and most Jews fled to Europe and North Africa. However, many Israelites did remain in the Land of Israel outside Jerusalem for a few centuries, although persecution gradually eroded at whatever Israelites population was left in their homeland. The area was conquered by Muslims in the 7th Century, and the Dome of the Rock was built by the Arab empire during this time. In the middle ages, European Christians invaded in a period known as the Crusades and established a small kingdom and killed off the non-Christian population, but after a few centuries were expelled. The land was then ruled for many years by different Muslim empires, culminating in the Ottoman Empire. During the six centuries that they ruled Jerusalem, Sultan Suleiman the Magnificent rebuilt the walls of the Old City of Jerusalem. During WWI, Palestine, as it was known, was captured by the British. The British designated the eastern two-thirds of Palestine as the country of Transjordan in the 1920's (now known as Jordan). The British agreed to support the idea of European Jews returning to their ancestral homeland in the remaining third of Palestine. In the late 1800s and the first two decades of the 19th Century, many European Jews fled persecution and pogroms to move to settlements in Mandatory Palestine. During the 1920s and 1930s there was mass migration of Jews into Palestine, many of them European Jews fleeing from anti-Semitic riots (caused by political movements in Germany) which would eventually lead to the Holocaust. 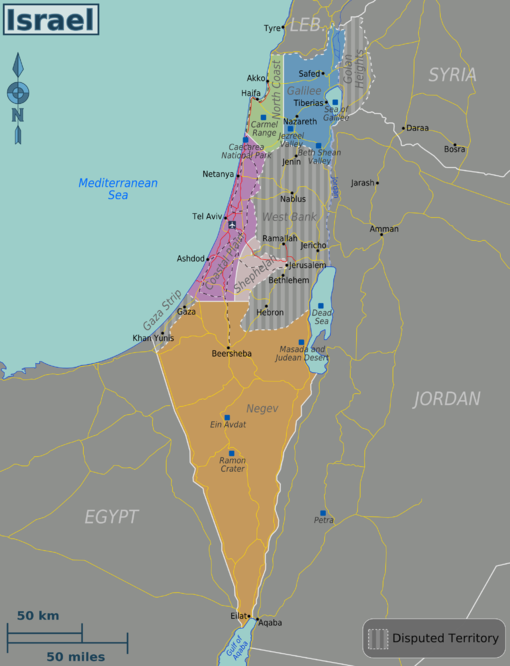 By 1939 the population of Palestine was one-third Jewish (by comparison, in 1917 the population was only 10% Jewish), but after the end of WWII in 1945, the British did not allow any further Jewish immigration into Palestine, fearing that the Arabs would launch a revolt against Britain's occupying forces if more Jews continued pouring into the colony. After two years of growing violence and terrorism, in the fall of 1947 the British decided to withdraw their troops from the remaining western third of Palestine. The UN recommended that the territory of Palestine be partitioned into two states: A Jewish state, and an Arab state. The Jews accepted the plan, but the Arabs firmly rejected it. Nonetheless, half a year later, on 14 May 1948, the British withdrew and the Jewish nationalists immediately declared independence as the State of Israel. The Arabs responded with a military invasion of the nascent State of Israel, and consequently no Arab State in western Palestine was ever established. The Israelis won a decisive victory in their War of Independence. Over the course of the war, approximately 600,000 Arabs in Palestine fled from the territory of the newly proclaimed Jewish state. To this day, it is hotly debated whether Israel forcibly expelled these people or they moved out on their own, but probably both occurred. Following the establishment of Israel in May 1948, there was a surge of immigration of refugees survivors of the European Holocaust which had not been allowed to enter Palestine under the British Mandate government. At the same time the surrounding Muslim countries expelled most of their Jewish populations, and Israel experienced a further surge of immigration of these Sephardic Jews from countries such as Morocco, Algeria, Tunisia, Egypt, Yemen, Iran, Iraq, Lebanon and Syria. To this day a large proportion of modern Israelis are the offspring of these refugees from those Arab countries. Following the fall of the Soviet Union in 1991 there was a further large wave of immigration of Jews from former Soviet countries and Russian has now became a common language heard in Israel. And in the past 30 years, Jews from Africa (and to a lesser extent, Asia & Latin America) have also been moving to Israel in large numbers, mostly from countries like Eritrea and Ethiopia. After the establishment of Israel in 1948, further fighting continued over the next few decades, and the Israelis won another decisive victory against the Arabs in the June 1967 Six-Day War. Following this victory and again in the Yom Kippur War of 1973, a slow movement towards peace and reconciliation began. In 1979, peace was concluded between Israel and Egypt, and in 1994, a peace treaty was signed with Jordan. Both agreements have held to this day. Attempts to create similar treaties with Lebanon, Syria, and the Palestinian-Arabs have failed. In 1982, Israel invaded Lebanon to dismantle the presence of the PLO, a nationalist Palestinian group that had taken refuge there and helped accelerate the Lebanese Civil War. Around this time the First Intifada was launched in the West Bank, with Palestinians carrying out acts of terrorism that was forcefully put down by Israel; and in 2000, failing peace talks, violence resurfaced when Palestinian-Arabs launched a violent insurrection against Israel, the so-called " Second Intifada". This has tapered off after the building of a wall in the West Bank. There have been occasional flare-ups over the past decade of missile attacks into southern Israel from the Hamas-controlled Gaza Strip (from which Israel withdrew totally in 2005). Three wars have been fought between Israel and Hamas (in 2008-09, 2012, and 2014) so far, and one in 2006 with Hezbollah. Israel won all of these wars, but has been pressured by the international community not to respond with enough force to completely destroy the Islamists, lest large numbers of civilians die or be forced from their homes in the conflict. In October 2015, a Third Intifada began mostly in the West Bank and Jerusalem, with anti-Semitic incitement leading Palestinians to launch terrorist stabbing attacks against Israelis that have killed 27, against a backdrop of over 100 Palestinians that have been killed by the Israelis, with the conflict currently ongoing. Israel has a technologically advanced market economy with substantial government participation. It depends on imports of crude oil, grains, raw materials and military equipment. Despite limited natural resources, Israel has intensively developed its agricultural and industrial sectors over the past 30 years. This may change in light of recent discoveries of huge natural gas and some oil finds off Israel's shores, which will reduce imports and increase government revenues. Israel is largely self-sufficient in food production except for grains. Cut diamonds, high-technology equipment, chemicals and chemical products, machinery and equipment, transport equipment, rubber, plastics, and textiles and services in various fields are the leading exports. For many years Israel posted sizable current account deficits, which were covered by large transfer payments from abroad and by foreign loans. However, the tight fiscal policy of recent years and the high growth rates have led Israel to a budget surplus in 2006. Roughly half of the government's foreign debt is owed to the US, which is its major source of economic and military aid. The influx of Jewish immigrants from the former USSR during the period 1989-99 coupled with the opening of new markets at the end of the Cold War, energized Israel's economy, which grew rapidly in the early 1990s. But growth began moderating in 1996 when the government imposed tighter fiscal and monetary policies and the immigration bonus petered out. Growth was a strong 6.4% in 2000. But the bitter Israeli-Palestinian conflict, increasingly the declines in the high-technology and tourist sectors, and fiscal austerity measures in the face of growing inflation have led to declines in GDP in 2001 and 2002. However, in 2007 the economic growth was 5.3% and the inflation was only 0.4%. In the first six months of 2008 tourism has grown with 45%. In 2011 Israel had one of the best performing economies in the OECD with low unemployment, relatively high growth rate, increased tourism and stable fiscal and monetary policies. The most obvious division in Israel's society is between Jews - who make up 75% of the population in Israel proper and 15%-40% in areas captured by Israel during the Six-Day War (West Bank, East Jerusalem and the Golan) - and non-Jews (mostly Israeli-Arabs), who make up nearly all of the rest. As well, some 350,000 people who emigrated to Israel from the former Soviet Union are not considered Jews according to halacha (Jewish religious law), though they largely identify with the Israeli mainstream. In terms of religious backgrounds, 77% are Jewish, 16% are Muslim, 4% are Christian Arabs and 2% are Druze. There are also deep divisions within Jewish society. First is the cultural division between the 'Ashkenazim', who lived in Europe for nearly 2000 years and are generally considered wealthier and politically better connected, and the 'Sephardim' and 'Mizrahim', who immigrated from the Middle East, Yemen and North Africa (Sephardi and Mizrahi immigrants from Europe tend to match the socio-economic profile of Ashkenazim.) In recent years, the divide between these ethnic groups has, however, grown much less acute and intermarriage has become common. While ethnic divisions have weakened as the native-born population has increased, religious tensions between 'secular' and 'Orthodox' Jews have increased. The spectrum ranges from the stringently-orthodox 'haredim', 15% (2008 est.) of the population but able to wield a sizable amount of power thanks to Israel's fractious coalition politics, to 50% who are 'modern orthodox' and finally 45% who consider themselves secular, although still adhere to some traditions. While secular Jews are widespread throughout all of Israel, orthodox Jews tend to concentrate mostly in certain cities such as Jerusalem and Bnei Brak. Israel is a Jewish state and, as such, public Holidays follow the Jewish calendar dates and vary from year to year. Different levels of activity stop in Israel depending on the festival or holiday, and different areas will see different levels of activity on these days. In the Jewish tradition, a new day begins at sunset, which means that Jewish holidays begin in the evening hours the day before the official date. In many ways, Israel is a secular country, so most festivals won't see big changes in the levels of tourist activity. Rosh Hashanah (Jewish New Year): Government offices and most businesses will be closed. This holiday is two days long, and usually falls in September. Yom Kippur (Day of Atonement): Government offices and almost all businesses, and transportation (including the airports) will be closed. A majority of Jews, regardless of religious level observe this holiday, as it is the most important in the Jewish calendar. Travel will be essentially impossible (even secular Israelis generally refrain from driving on this day). Yom Kippur usually falls between mid September and mid October. Succot (Feast of Booths): Government offices and most businesses will be closed for the first day of this seven day holiday. Many neighborhoods will feature temporary huts, where religious people live for seven days. Succot usually falls in Late September or October. Shmini Atzeret and Simchat Torah (The 8th day of Assembly and Rejoicing the Torah): Immediately follows after the first seven days of Sukkot and is a separate holiday in its own right. Like the first day of Sukkot, government offices and most businesses will be closed. Chanukah (Festival of Lights): Work continues as usual during this eight day holiday falling between late November and late December. Be sure to sample the holiday food. Purim: Businesses operate as usual; however, Purim is one big party. Do not be surprised to see people, even children, drinking, singing, and dancing. Many people wear costumes. In Jerusalem (and walled cities during biblical times), Purim is celebrated a day later (and is called Shushan Purim) Purim falls from late February to late March. Pesach (Passover): Government offices and most businesses will be closed for the first and last days of this seven day holiday. For the remaining five, government offices and most businesses will work a half day. Most restaurants will serve an alternative menu to comply to dietary restrictions. Passover falls Late March to Late April. Holocaust Remembrance Day: Government offices and businesses will be open, except for entertainment. There will be many memorial services happening around the country. An air raid siren will sound at 10am, when the entire country will stop and stand for a minute of silence, even if they are driving on the highway. Please be aware of this if you are on the road. Holocaust Remembrance Day falls in late spring. Memorial Day: Government offices and businesses will be open, except for entertainment. There will be memorial services happening around the country, especially near cemeteries. An air raid siren will sound at 20:00 (the night before), and again at 11:00, when the entire country will stop and stand for a minute of silence, even if they are driving on the highway. Please be aware of this if you are on the road. Memorial day falls in late spring. Independence Day: Government offices and most businesses will be closed but, because it's a secular holiday, many shops will be open (some with shorter opening hours) and public transport service will be available, but with a lower level of service. Huge parties will be happening all over the country in almost every city at the night before. Independence day falls in early summer. Shavuot (Feast of Weeks): Government offices and most businesses will be closed. Shavuot falls in late spring. Tisha B'Av (Fast of the Ninth of Av): Government offices and most businesses will be open, except for entertainment. Tisha B'Av falls in late summer. Christmas - Christmas is mainly celebrated in the city of Nazareth, there are also Christmas celebrations in another Arab populated areas with Christian community or mixed cities, Christmas also celebrated in Ein Kerem district at Saint John Church which marks the birthplace of John the Baptist. Easter - the main celebration of Easter is in the Church of the Holy Sepulchre in Jerusalem. Ramadan Al-Aqsa Mosque in Jerusalem is the most attractive mosque during Ramadan, at Eid al-Fitr Al-Jazzar Mosque in Acre shows the Shahr al-Nabi (a lock of hair from the beard of Mohammed the Prophet) which attract many Israeli-Arabs and Palestinians from the West Bank while visiting Israel at Ramadan. Eid al-Adha - both Sunni and Druze Muslims celebrate it. Ziyarat - an annual pilgrimage events for Muslims in holy places which are not the Kaaba in Mecca. the most holiest site for Ziyarat in Israel for Muslims are the Al-Aqsa Mosque and the Dome of the Rock in Jerusalem for Sunnis and Tomb of Nabi Shu'ayb (Prophet Jethro) in Hattin near Tiberias to Druze, there are many Islamic Shrines in Israel like Sidna Ali Mosque in Herzliya, Nabi Rubin in Palmachim, Nabi Saleh in Ramla, Nabi Ukasha in Jerusalem, Maqam Abu Ibrahim in Daliyat al-Karmel, Nabi Sabalan in Hurfeish and many more. The voltage in Israel is 230V, and the frequency is 50 Hz. The electric outlets used are type H and Type C. Type H is a uniquely Israeli three-pronged standard, but most modern type H outlets (rounded) can also accept type C European two-pronged plugs while Type C outlet is available only in old housing. In fact, most electronic devices in Israel use type C plugs. Electricity is supplied by the Israel Electric Corporation. The special phone number 103 can be used to reach the customer service center. Winter: Rain will be moderate in the winter, and there can even be snow at higher altitudes, especially in the north. Temperatures will vary widely, especially in the south. Day temperatures could provide enough warmth to take a visit to the beach, while night temperatures may necessitate a heavy jacket. As the winter is not uniform, bouts of rainy, cold days can and usually will be followed by succesive days of comfortable sunshine, often allowing summer clothes to be worn. Bring clothing for any weather and any temperature. This region can be divided into the Upper Galilee and Lower Galilee hill ranges, as well as the Jezreel Valley and the Sea of Galilee. Sometimes called "Western Galilee", this region extends along the Mediterranean shore from Haifa to Rosh Haniqra and the Lebanese border. It also includes the Carmel Range. The most developed part of Israel, between the Carmel Range and the Gaza Strip. The area north of Tel Aviv is known as the Sharon. The fertile, hilly hinterland between the Coastal Plain and the Judean highlands. Desert covering much of the south of Israel, including Ramon Crater. Also includes the Israeli parts of the Judean Desert and the Dead Sea. The West Bank, locally known as 'Judea and Samaria' or simply The Territories, is internationally recognized as part of 'Palestine' by the UN. However, a number of Israelis reside in settlements (whose legality is disputed) within these territories. Government services (security, medical service, etc.) are provided by Israel, the Palestinian Authority, or a combination, depending on the exact location. The Gaza Strip is a narrow piece of land along the Mediterranean coast between Israel and Egypt. Just 40km (25 miles) long and 10km wide, it is home to more than 1.7 million residents. The Gaza Strip is ruled by Hamas, and is unsafe for travel. Gaza is not under Israeli occupation, as Israel evacuated its settlers and from the Strip in 2005; however, Hamas has periodically attacked Israeli citizens, leading to armed conflicts in 2008-09, 2012, and 2014. Israel controls Gaza's land, sea and air borders. Mountainous area north-east of the Sea of Galilee. Occupied in 1967 by Israel, unilaterally annexed in 1980, and claimed by Syria. As Palestinian territories are remarkably different from a traveller's point of view, information on travel to and within them can be found under the entry Palestinian Territories. This is not a political endorsement of claims by any side in the dispute over the sovereignty of these territories. Akko (Acre) — an ancient walled port town and UNESCO World Heritage site home to Muslims, Christians, Jews, Bahá'í, and Druze. Beit Guvrin-Maresha - includes big ruined Roman city at Beit Guvrin, Cave human settlements in Maresha (especially known for its Sidonian Cave), big Crusader church of St.Anne and the Shrine and Tomb of Prophet Muhammad's Sahabah Tamim al-Dari. If continuing from Israel on to Arab countries, it's recommended that you discard any sort of proof of your visit to Israel. As of 2013, Israel no longer stamps passports when arriving at Ben Gurion Airport, so a passport stamp proof is no longer an issue (instead, they give you a slip the size of a credit card which must be presented on exit as proof of legal entry - keep an eye on it). Some countries like Jordan do not bother much whether you have been to Israel or not, but others like Syria will show you out on any sort of proof of having visited Israel, such as a product with a Hebrew label. Double check your items if in ambiguity. Note that immigration officials at Israel's land border crossings with Egypt and Jordan, as well as Egyptian and Jordanian officials on their sides of the aforementioned crossings, often will stamp your passport. You can ask them to stamp a piece of paper instead, but there is no guarantee that they will grant your request (see below). Note that even an Egyptian or Jordanian entry or exit stamp from one of its land border crossings with Israel will constitute proof of visiting Israel and cause the problem stated above. Likewise, if you are from an Arab, Middle Eastern or Muslim background or if have an Arabic or Muslim sounding name even if you hold a western passport or if you are suspected by immigration authorities of intending to visit the West Bank you can expect to be subjected to a tough interrogation by immigration officers and an invasive search of your self and your belongings. There are a large number of reports by passengers who have been deported and refused entry to Israel after being subjected to interrogations and held in confinement without any explanation being provided or access given to consular authorities. Reports have recently been made of immigration authorities demanding access to some travelers' gmail and Facebook accounts. You must fill out form 17L including your personal details, and that form shall be stamped by passport control upon entry/exit. The form 17L will not be collected upon exit of airport as it is necessary for the collection of tax refunds and proof of legal entry. Ben Gurion International Airport is the main entry point for most visitors to Israel. Many countries have a Visa Waiver program with Israel which allows their citizens to visit Israel without a visa arranged in advance. Before embarking on a trip, visitors desiring to stop in Israel on their way to other destinations must check if they need a prearranged tourist visa. The list of countries below specifies from which countries tourists are required to present a prearranged visa. All Visa Waiver Program travelers must present a machine-readable passport at the port of entry in order to enter Israel without a prearranged visa; otherwise a visa is required. This applies to tourists arriving with a passage card from countries with a Waiver Program. If you're in Israel on a tourist visa (B2) and decide to renew your visa for a longer term, you may do so at the Ministry of the Interior Visa office. In Tel Aviv, it is located at 125 Derech Menachem Begin on the second floor. The office opens Su-W 08:00-12:00. Alternately, citizens from most European and North American countries can renew their visas by crossing into Jordan and returning to Israel at the Arava border crossing near Eilat, or by crossing into Egypt and returning to Israel at the Taba crossing. NOTE: The official procedure of the Israeli Population and Immigration Authority for requests to stamp a separate from state that if the visitor is from a Visa Waiver program country they will check each case individually (so, unless there is a specific reason it will be approved), if the visitor is not from a Waiver program country the request will be denied, except for a few exceptions (which includes high ranking visitors or clear economic or political reason. In this case the best option is to file a request prior to the visit. Requests from visitors from countries have no diplomatic relations with Israel will be refused (unless the Law of Return applies on the visitor). The local representative of the Ministry of Interior can authorize exceptions. There are mixed reports about Israeli passport stamps and the southernmost border crossing (Eilat - Aqaba, next to the Red Sea). In some cases, the crossing can be done without any stamps being placed in your passport (entrance or exit). No extra fees are incurred and all stamps are placed on separate cards given to you by immigration officers. If this is the case, it will appear (once you throw out the cards) that you have never left your starting country. Done with Canadian Passports in January of 2014. In other cases, the immigration officials at the Eilat - Aqaba border crossing do not heed your polite request to have them stamp only the paper, and instead stamp your passport, which can make travel to some middle eastern countries more difficult. The main airport in Israel is Tel Aviv's Ben-Gurion but recently Ryanair opened a few winter low-cost connections, very popular among tourists, to Ovda airport near Eilat. Security measures above and beyond what you might encounter in most countries are taken for flights both to and from Israel. These measures are undertaken for your safety and security and the security of Israel. On arrival in Israel, as with all countries, passengers will be required to go through passport control, where it is possible that you will be pulled aside for additional questioning. If traveling as part of a group, questioning will be done individually. Foreign citizens whom Israeli authorities suspect of being of Arab, Middle Eastern, or Muslim origin may face additional, often time-consuming and probing questioning by immigration and border authorities, or may even be denied entry into Israel, the West Bank, or Gaza. Upon departure from Israel, arriving at the terminal at least three hours before your flight is well advised, as Israeli security procedures can be time-consuming. Bag inspection, both by machine and hand, is routine and should be expected, in addition to an interview about your time in Israel. The interview is casual, as the security personnel just want to ensure that you are not a potential threat. Israel's main international airport is Tel Aviv's Ben-Gurion International Airport (code IATA:TLV, ICAO: LLBG) which is approximately 40km from Jerusalem and 12 km from central Tel Aviv, and serves both cities. Ben Gurion acts as a hub for Israel's three main international airlines, El Al Israel's largest airline and flag carrier offering flights across the globe, Arkia Israel Airlines, Israel's largest domestic airline that also serves a number of European destinations, and Israir that also serves many European destinations. Most American and European carriers have flights to Tel-Aviv, a full list of which can be found on the airport's website. There are many websites that allow early purchase of flight ticket. Please note that El Al does not fly during the Jewish Shabbat (from sunset on Friday to sunset on Saturday) or on Jewish holidays. Transportation to and from the airport is very convenient. Visitors can access Ben-Gurion by train, bus, taxi, or Sheirut (shared taxi). Note that bus and train service are suspended from Friday afternoon to Saturday evening (this also applies to some of the holidays: Rosh HaShana, Yom Kippur, the first and the eighth days of Sukkot, the first and the seventh days of Passover, and Shavuot). Israel Railways is the preferred transportation option where available. Convenient trains to many points in Israel leave from the Ben Gurion Airport station, which is adjacent to the terminal. Buses to some points in Israel receive passengers at Airport City, a location a few minutes from the airport. To access this bus stop, take bus 5 Egged bus from the terminal to Airport City, also known as El Al Junction. If continuing with an Egged bus, you can get a combined ticket that will effectively make the ride on bus 5 free. Tell the driver of bus 5 your final destination and they will sell you a ticket to your final destination and save you the price of the local ride. Buses to most towns in Israel leave from the Arlozorov Terminal in Tel Aviv, also known as Terminal 2000, which is located at the Tel Aviv Savidor Center (Merkaz) railway station (see train to Tel Aviv below). Sherut (shared taxi): "Nesher" shared taxis are available from the terminal to any point in Jerusalem, and can be reserved from any point in Jerusalem to the airport. The sherut operates 24/7, even on Shabbat, and is a ₪63 per passenger for door-to-door service. Bus: Look for signs in the airport leading you to Public transportation, located right outside the airport. You're looking for bus 485 operated by the "Afikim" company. The bus departs on the hour, 24 hours a day. The bus cost NIS 16 (as of December 2017), which is the cheapest option of reaching Jerusalem from the airport or vice versa. Please note that the bus doesn't operate on the Jewish Sabbath and Israeli Holidays. Ask the driver one of the passengers to guide you to get off by "Binyaney Ha'uma", which is a 3 minute walk to the Central Bus Station (via the underpass next to the bus stop). On the way back to the airport, you'll find the bus leaving from outside the Central Bus Station, in front of the "Discount" Bank (If you're facing the main entrance to the Central Bus Station, turn right and walk 2 minutes up Jaffa Street, until you see the green signs of the "Discount" Bank. The bus departs every hour on the 10th minute. Another option (though much more annoying and time consuming) is taking the Egged number 5 bus from the airport to the "El Al" Junction, located about 10 minutes outside the airport. When getting on the Number 5 bus, tell the driver you're going to Jerusalem, and pay him NIS 27. Keep the ticket as you'll need it to transfer to your next ride. From the El Al Junction you will switch to Egged line 947 or 950 (07:00-21:00, every 20 minutes, to the Central Bus Station). Be careful not to accidentally board the bus going to Haifa (947) or Netanya (950). Train: A new fast railway between the airport and Jerusalem has opened in 2018. its takes about 24 minutes to get to Yitzak Navon station where you can take a light-rail train or a bus to every part in the city. Currently you can order a ticket for free at the Israeli Rails' Website if you have rav-kav or pay 17₪ for the ride. Train: Take the direct Tel-Aviv train (24 hours a day except for Shabbat, every half an hour during day, every hour during night, ₪16 - updated for May 2014). Most trains to Tel Aviv have Nahariya as their final destination. There are four railway stations in Tel Aviv, and all trains stop at all of them. Bus (inferior option): Take line 475 to the Tel Aviv Central Bus Station from El Al Junction until about 22:15. Line 476 leaves at c. 21:30 and 22:50, stopping directly at Terminal 3's bus platform instead, and also going to the Tel Aviv Central Bus Station. Schedules can be found in Google Maps, Moovit and other public transport apps. Be careful not to board the buses going to Lod. Train: Take the direct train from Ben-Gurion Station to Haifa (24 hours a day except for Shabbat, every half an hour during day, every hour during night). Most trains to Haifa have Nahariya as their final destination. There are a few train stations in Haifa. The central bus station is Haifa Hof HaCarmel. The downtown station is Haifa Center HaShmona. A trip costs ₪41.50 (updated for May 2014). Stay on the train a few more stops and you'll be in Acre (Akko). Sherut (shared taxi): "Amal" shared taxis are available from the terminal to any point in the Haifa metropolitan area, and can be reserved from any point in the Haifa metropolital area to the airport. The sherut operates 24/7, even on Shabbat. Bus (inferior option): Take the Line 947 Egged bus to access points north of the airport. The bus goes from the airport to Haifa, stopping at Petakh Tikvah, Ra'anana, Netanya, and Hadera. The ride to Haifa costs ₪37.50, and runs from 06:41-21:10. Schedules can be found in Google Maps, Moovit and other public transport apps. All other locations in Israel can be reached easily from these three cities, or directly by train from the airport. In 2015 Ryanair opened a few winter season low-cost connections from Budapest, Cracow, Bratislava and Kaunas and the connections became immediate hits thanks to prices as low as 10 EUR one way. Be aware that exchange rates at Ovda airport are very bad so better have some NIS with you just in case. Bus to Eilat/Taba: The airport is very well connected to Eilat/Taba with Egged bus 282 - the schedule is adjusted to planes schedule - buses wait for people to disembark. On your way back if bus is full at Eilat Bus Station then additional bus is provided - best ask at Eilat Bus Station Information - they will provide platform, departure hour and cost - usually it leaves the Eilat Bus Station around 3,5 hours before plane departure (it leaves Taba half of an hour earlier). Price from Eilat was NIS 21,50 in March 2016. You can pay in NIS only! Bus to Beer Sheva: This does not work on Saturdays and Fridays afternoon and is a risky operation - it is advised to go to Eilat instead as it may be faster. But if you are not afraid - you can walk out of the Airport to road 12 and there is bus stop there of bus 392 that goes to Beer Sheva. Ensure that the bus does run and at the time you want. In Beer Sheva you have connection to Jerusalem and other cities. Shuttle: Eilat Shuttle runs from the airport to Eilat, JErusalem, Tel Aviv, Aqaba and Taba - book in advance as they might be already full on the day of your arival. Prices from 25NIS to USD35. Will be replaced by Ramon Airport, under construction. An old airport located in the center of Eilat - need more info if there are international flights to it. It's surprisingly difficult to travel to Israel by boat. The main route is from Limassol in Cyprus to Haifa, and the main operators are Louis Cruises and Salamis Cruises. As the name says, these are cruise services and they do not advertise one-way fares, but they may be willing to carry you for around €150-170 if you're persistent and they have space -- showing up at the port office on the day of departure may work. Both companies seem to start and stop cruises on short notice, so inquire locally. There are five border crossings that can be reached by road. There are two on the Egyptian border and three on the Jordanian border. There are no border crossings accessible to tourists with either Syria or Lebanon. All border crossings have extensive security measures in place to ensure the safety of both Israelis and tourists. Allenby/King Hussein Bridge: Is located just north of the Dead Sea, in the center of the country. This crossing is the the shortest way between the capitals, Amman and Jerusalem, and is the busiest land crossing. The crossing is open Su-Th 08:00-23:59, and F-Sa 08:00-15:00. The crossing only closes for Yom Kippur, the Day of Atonement, and Eid al-Adha, the Feast of the Sacrifice. Jordan River: This crossing is located just south of the Sea of Galilee, near Tiberias. The crossing is open Su-Th 06:30-21:00; F-Sa 08:00-20:00. Entry into the crossing for processing will end at 19:00 on Fridays to ensure that the crossing closes on time. The crossing only closes for Yom Kippur, the Day of Atonement, and Id al-Hijara, the Muslim New Year. Yitzhak Rabin: This crossing is located in the south, a few km from Eilat. This crossing is used mostly by tourists visiting Petra, a day trip that is very much worth your time. It is highly recommended that any trip to Petra be with an organized tour, as crossing the border can be time consuming, and you can book these through most of the local hotels/resorts or on your own (you will likely be picked up at your hotel around 07:00 and driven to the border and provided assistance with the border bureaucracy. After crossing the border you will be met by a Jordanian tour guide who will take you to Petra and back to the border afterwards, around 19:00) The crossing is open Su-Th 06:00-20:00; F-Sa 08:00-20:00. The crossing only closes for Yom Kippur, the Day of Atonement, and Eid al-Adha, the Feast of the Sacrifice. Nitzhana: This crossing is located in the Negev, south of the Gaza Strip. The crossing is open Su-Th 08:30-16:30. The crossing is closed for most Jewish and Muslim holidays. Please check in advance if you intend to use this crossing. Taba: This crossing is located just south of Eilat. The terminal is open 24 hours a day, 7 days a week, with the exception of Yom Kippur, the Day of Atonement, and Eid al-Adha, the Muslim Feast of Sacrifice. This is the preferred crossing if you intend to visit Egypt. There is one border crossing with Gaza, the Karni crossing. However, before embarking on a journey to Gaza, be sure to make arrangements well in advance. The Israeli army patrols this crossing heavily, and exiting and entering Israel may be difficult and time consuming. Israeli rental cars are not generally permitted across the borders for insurance reasons. In addition, it may not be advisable to travel in Arab countries while displaying an Israeli number plate. Daily direct buses are available from Amman to Tel Aviv, Haifa and Nazareth, via the King Hussein bridge. Call the operator (+972 4-6573984) for details. Otherwise, you can take a taxi from the north bus terminal in Amman (JOD5 each for four people sharing: if you don't have a group, either wait for either people to arrive or pay JOD20 and go yourself). After clearing Jordan customs, a separate JETT bus will take you across the border to Israeli customs for a small fee, then once past Israeli customs, a Palestinian bus company offers buses to Jericho and Ramallah. From Ramallah, a share taxi will take you to Jerusalem. If you have more money to spend, there are buses from Tel Aviv and Jerusalem (USD95-110 one way) to Cairo, operated by Matzada tours (Tel +972-2-6235777) and Aviv tours (Tel 972-36041811). You still have to change buses at the border. In getting around Israel, be aware of the Sabbath: from Friday at sundown to Saturday at nightfall, train and bus services are not available in Israel (except in Haifa, Nazareth and Eilat, and limited sherut services - shared taxis, see below). Unless you have a car, or are willing to pay for a taxi (not shared), if you're day tripping on a Friday, you should start thinking about how to get back by noon at the latest, and you should plan on staying near your lodgings on Saturday. Use the official government site, Google Maps, Moovit or other private sites or apps to help plan your trip. Buses are the most common form of public transportation for Israelis and travelers alike. They are cheap, fast and reliable. The only problem tourists will face is that your journey through Israel by bus requires planning; a problem the article Bus travel in Israel aims to solve. Even though there are several bus companies running different bus lines (sometimes even within the same city), information and payment are generally unified and supervised by the government. The most recommended way to master the bus routes it to use public transport mobile apps such as Moovit or Google Maps in order to get the best route available. *8787 is the phone number for bus info call center (all bus companies). A Rav Kav card, which can be obtained from bus drivers and at train stations, is accepted in all buses and trains in Israel, and will save you 20% of the cost of every bus or railway trip if charged with money ("erekh tsavur"). Faster than normal buses are minivans, known as monit sherut or "service taxi", that generally follow major bus routes but can be hailed from anywhere on the route (not just official bus stops). They are usually quicker than buses, their operations hours may be longer - and maybe most importantly, in many cases the sherut runs 7 days a week, including on Shabbat. Trains run 2-3 times per hour in peak travel times and at least once an hour at off peak hours. Trains on the Nahariya-Haifa-Tel Aviv-Ben Gurion Airport line run through the night too. Note, however, that after midnight trains stop in Haifa at the Hof Hacarmel station only, and in Tel Aviv at Merkaz (Central). All other Tel Aviv and Haifa stations close after midnight. One must also remember that trains operate only on weekdays (there are no trains from Friday afternoon till Saturday evening). In fact, the trains stop several hours earlier on Friday than buses do. Following the re-opening of the renewed tracks from Beer-Sheba to Tel-Aviv, all night trains running this line after midnight stop at Ben Gurion Airport as well (travel time is approx. 59 minutes). A high-speed train line from Tel Aviv to Jerusalem via Ben Gurion airport is now under construction and is scheduled to open March 30, 2018. When open the Jerusalem to Tel-Aviv line is supposed to take 28 minutes from station to station. For now, the only train to Jerusalem via Beit Shemesh is very slow, and it ends in the out-of-the-way Jerusalem Malcha station. It's Israel's most scenic rail ride, though, and the area it traverses is sometimes called "Little Switzerland". In winter, after a rare heavy snowstorm, Jerusalem may get cut off for a up to a day from the rest of the country by road, making the train the only possible connection between the capital and other parts of Israel. The scenic line to Jerusalem was built by the Ottoman Turks and dates back to 1892. Because of the long travel time and inconvenient location of the Jerusalem Malcha station, the line is not widely used. During holiday periods these trains can get crowded, though. In 2012 a line that connects Tel Aviv to its southern suburbs - Holon, Bat Yam and Rishon LeZion has also been opened and today it continues via Yavne West, Ashdod, Ashkelon, Sderot, Netivot and Ofakim to Be'er Sheva (North University and Center stations). Train fares are generally more expensive then equivalent bus fares (especially for the line from Tel Aviv to Beer Sheva, with the train fare almost double that of the bus fare). In exchange, you can generally expect a much higher level of comfort, speed, and safety. Some lines have double-decker carriages. Taxis are very common in Israel. To differentiate from a shared taxi (sherut), a regular Israel taxi (monit regila) is sometimes called special (using the English word). The driver should use the meter both inside and outside cities (in Hebrew, moneh), unless the passenger agrees to prefix a price (however agreeing to go off the meter is almost universally in the driver's favor). There are surcharges; for calling a taxi (₪3.50 as of June 2006), for luggage (₪2.90 a piece) and for hailing a taxi at Ben Gurion Airport (₪5). Drivers are known to try to cheat tourists by not turning on the meter to begin with and then fighting about the cost at the end of the ride. It is best to specify that you absolutely require the 'moneh' to be activated before you leave unless you know how much the trip should cost, in which case you can make a deal. However, if you are caught off guard some drivers will become extremely rude or even violent if you refuse to pay despite the meter never having been switched on. It is best to try to avoid this common situation but it is better to avoid any conflict with the driver by paying and learning rather than saving your money and risking an unpredictable escalation. Noting the taxis number clearly visible on the outside of the cab and contacting the local taxi authority is an efficient form of redress. Having said this one anachronism is that Israeli taxi drivers do not expect a tip and neither should you generally offer one. In addition they are more likely to round the fare down to the nearest shekel than up. All Israeli taxis are numbered and all print out an official receipt on printers attached to their meters, invaluable if you are traveling on business. You can use taxi service to get from Ben Gurion airport to almost any city in Israel. Fares are fixed and published and all taxis from the airport belong to the Hadar taci company the taxi queue is rapid efficient and the attendents, though brusque, will help. The taxi point is just by the airport station entrance. Never ever take a touted taxi. transportation from the airport and a good starting point to find a taxi ride would be to visit the Ben Gurion Airport's taxi guidelines page  or booking a taxi from a private taxi company such as Israel Taxi  and many others who offer shuttle service from and to Ben Gurion airport. However, trains are a significantly cheaper option. Israel is known to be one of the easiest places to hitchhike in the world. Most major junctions have a shelter and are well lit throughout the night. This is a great way to meet and interact with the locals. A sign can help (put a blank piece of paper inside a plastic sleeve, and with a dry-erase marker you have a reusable hitchhiking sign). Local West Bank settlers rely heavily on hitchhiking for transportation. Almost every car will stop and suggest a lift if you stand in any settlement's gate as most of them are defended by IDF soldiers. Nevertheless, It is only safe to hitchhike between Jewish settlements/cities, or a few well known and well defended junctions; any other way is considered especially dangerous. Israel has a modern highway network, connecting all destinations throughout the country. Most roads are well maintained. In recent years, increased investment into infrastructure has further improved the condition of roads. Most roads are numbered according to orientation and significance. In general, east-west roads are given odd numbers, and north-south roads are given even numbers. Generally, most significant national highways are numbered using one or two digits and less-significant, local roads are numbered using four digits, but exceptions to these rules do exist. All junctions and exits are signed with the name of the junction or interchange, the number of the road it leads to, and the name of cities or streets it leads to. When getting directions, it's best to ask for the name of an exit as well the exit right before it. Parking regulations are indicated by curb markings. Red and white markings mean parking is prohibited, although this rule is often flouted outside weekday daytimes. However, just because others are doing so, doesn't mean your car won't be fined or towed. Do not stop near curbs marked red and yellow, because these are usually reserved for certain vehicles, such as buses at bus stops. Blue and white markings permit parking only with a parking permit purchased at a machine. There is not always a machine nearby, if so, parking tickets must be purchased at a local kiosk or a cellphone payment system must be used. In some areas, such as in parts of Tel Aviv, blue and white markings are restricted even at night to residents only. A sign at the beginning of the street, usually in Hebrew only, will explain the specific restrictions. Similarly, red and grey areas are reserved for residents, but might only be reserved at specific times as stated in signs. Grey areas are free to park at. And of course, do not park in handicapped zones bearing international markings. Israel uses the metric system of measurements. Default speed limits are 50 km/h in residential zones, 80 km/h on intercity roads without a physical separation median between opposing lanes, and 90 km/h on intercity roads with a physical separation median. By default, all major freeways (identified by the standard blue European motorway sign) have a speed limit of 110 km/h; however, in practice, speed limit signs bearing a lower limit (usually 90 km/h or 100 km/h) limit the speed on most of these roads. Police vehicles in active duty may have their blue lights on for the duration of their trip. Like several countries in Europe (but unlike such as the US) - In Israel this is not a sign that they want to pull you over. If they do, they would either turn on their siren or use a loudspeaker to instruct you to stop on the shoulder. A verbal request, although usually made in Hebrew, will usually include the make of the car. It is advisable to comply. On the main section (from Iron interchange to Sorek interchange) the minimum charge is for 3 segments (even if you drove through fewer segments) and the maximum charge is for 5 segments (even if you drove through more segments). On the northern segment (one segment from Iron interchange to Ein Tut interchange) there is a separate special charge, as it's not a part of the main section. On the southern section (from Sorek interchange to Ma'ahaz interchange) is free of charge. Various subscriptions are available. Consult your rental company regarding payment of route 6 rides, as they often carry a surcharge. The Carmel Tunnels is a set of 4 tunnels (2 in each direction with the Neve Sha'anan interchange between them) that crosses Haifa under the Carmel mountain. The cost is determined by the number of segments that you use (1 or 2 segments). There are toll booths in this road. The Fast Lane is a 13km high occupancy toll lane on highway 1 from the Ben Gurion interchange to Tel Aviv. The lane uses the congestion pricing system which means that the tolls change throughout the day according to real-time traffic conditions so more traffic means higher prices, the price is displayed on signs at the entrance to the lane. The current price (May 2014) varies from 7 NIS to 85 NIS per use. However high-occupancy vehicles, like buses or car with 4 occupants or more, are exempted (depending on traffic conditions, free use might also apply to cars with 3 occupants, this will be indicated on the entrance sign). Apart from buses, high capacity cars must stop at the Park and Ride facility (located about 1km after the entrance) for validation, otherwise they will be charged full price. Like on highway 6, cars are identified by license plates and/or electronic tags, and bills are sent to the car's registered owner. It is possible to pay in a toll booth, however they are not located at the entrance to the lane so the driver must get off at the Park and Ride facility for the payment. As mentioned, there is a free Park and Ride facility about 1km after the entrance to the lane so you can park your car there, free of charge, and take one of the 2 free bus shuttles to Tel Aviv center (Kirya line) and the Ramat Gan diamond exchange area. Shuttle operating hours are from 06:00-23:00 every 15 minutes (on rush hours 06:30-09:30 and from 15:30-19:00 every 5 minutes). Be aware that the cars that will leave the car park after midnight will pay a fine. If you enter the car park for less the 30 minutes (like to drop off someone) you must pass through a check point, otherwise you will be charge for use of the lane. The lane leads directly to highway 20 (Ayalon highway) leading north and there are no exits before that. All drivers in Israel must carry a driver's license. International driver permits, as well as licenses from foreign countries are accepted. Drivers of motor vehicles must be at least 17 years old, whilst insurance is mandatory. Driving a motorcycle or a moped is permitted starting at the age of 16, A drivers license is mandatory for two wheel vehicles as well! All cars in Israel must undergo an annual safety inspection, and a sticker bearing the month and year of the next inspection should appear on the front windshield. Recently, there has been a law passed (similar to many european countries) that require for every car to carry a yellow reflective vest at all times. Theoretically, the police could stop you at any time and ask to see it. If you stop on the edge of the road, and have to get out, you are are required by law to wear the vest. All rental cars should have one so it is a good idea to check before you leave. Note that in Israel the police are allowed to stop you for any reason whatsoever; mostly they do so for license checkups. Most major international car rental companies; Hertz, Avis, Budget and Sixt Israel , as well as many Israeli ones including, Eldan (Israel's largest car rental company), Traffic and Tamir, a car rental service that delivers and picks up your rental car. If your interest in touring Israel goes beyond the 2 dozen or so famous tourist sites, then consider a private/rental vehicle and a professional tour guide. The tour guide will run about $200/day, plus the vehicle rental. They can take you to more than 1,500 other sites missed by the package tours or aimless personal touring. Golan Heights Trail - tail across the Golan Heights from Mount Hermon in the north to Kibbutz HaOn in the south. English is the most popular foreign language. Israelis study English in school from an early age, and it is commonly understood in Israel. Older people are generally unable to converse in proper English and some knowledge of Hebrew will come in handy. All street and road signs (and many others) have English names, as well as the Hebrew and Arabic names. Massive immigration from the former Soviet Union in the 1990s brought a large number of immigrants who speak Russian. Other commonly encountered languages in Israel, reflecting the diverse origins of Israelis, include Romanian, French, German, Polish and Spanish. Some of the older members of the population and some of the ultra-orthodox population speak Yiddish, an Eastern-European Germanic Jewish language – you might get by sort-of if you speak German. Foreign workers from China, Philippines, Thailand, and other Asian countries can be seen everywhere in central Israel. You can hear a mix of a dozen languages while on buses, trains or walking in transportation hubs, especially in Tel Aviv central bus station. While speaking Hebrew Slang, words of Arabic origin are commonly used. For example: "Walla?" (Is that so? ), "Yalla!" (Come on, let’s move! ), "Sababa" (great), "Akhla" (good), "Sachbak" (friend), and many more. Street talk is also much affected by military jargon, which is second nature to many Israelis. Foreign television programmes and films are mostly American, and almost always shown in their original language with subtitles. Only children's programmes are dubbed into Hebrew. There is a wide choice for shoppers in Israel. There are also very animated Jewish markets (shuks) of tremendous cultural diversity, notably the Carmel Market in Tel Aviv and Machane Yehuda in Jerusalem. The best place to buy food is at these outdoor markets; the produce is cheap and fresh. The following banknotes are in circulation: ₪20 (green), ₪50 (violet or, as of new issue, green), ₪100 (brown or, as of new issue, yellow), ₪200 (red or, as of new issue, blue). Newer ₪20 notes are made of polypropylene and are almost impossible to break or tear. since 2014 there is a new ₪50 banknote that is green, but the old violet is still acceptable. Paying with large notes for small charges is frowned upon. US Dollars are accepted in some tourist locations, particularly Jerusalem, at a rough exchange rate of ₪4 to the dollar. If you are asked for dollars or euros outright, you are most likely being ripped off. Living and travelling costs in Israel are almost on a par with Western Europe, North America and Australia, making it by far the most 'expensive' country in the Middle East region outside the Gulf area. Small food kiosks (pitsutsiot) offer various snacks such as freshly roasted peanuts, sunflower, and melon seeds, soft drinks, cigarettes and candy. Take note that currently (April 2017) the price of a soft drink can is between ₪5-8 and a 0.5L bottle is generally one shekel more expensive than a can. Prices in tourist areas in big cities, especially tourist cities like Eilat can be up to ₪20 per 0.5L bottle, however often a small walk will reveal the more local places/supermarkets that will sell you 6 1.5L bottles for as cheap as ₪8.40. In fact, it is possible to buy a 6 pack of 2 liter "Ein Gedi" bottles for a preset price of ₪12. Fast food wise, a shawarma in lafa should cost roughly ₪24-30 (drink not included), while a regular meal at a burger chain (McDonald's, Burger King and the local Burger Ranch) will set you back at least ₪35 -- and "free refills" are generally not offered anywhere in Israel. Lowest cost options are falafel in pita - it is more expensive in more tourist places than normal ones and more expensie in Israeli sites than Arab/Palestinian ones. Example for falafel pita: Eilat: promenade - from ₪22, bus station area ₪17, poor neighbourhood ₪10. Jerusalem: Arab quarter: ₪10-12, Bethlehem (Palestine) main square ₪5. Restaurants generally are in a high standard of taste and style, a first course averages ₪15-25, a main dish about ₪40-60 (good meat can go from ₪60-100) and the desserts are usually ₪25-35. Soft drinks are somewhat costly and usually go for ₪10-12 for an average sized glass without refills. Outside of the food industry, tipping is not common. Restaurants - Tip 10%-15%. 15%-20% is considered a generous tip. Tour guides - 10% - 15% of the daily rate. Bartenders - Tip 10%-15%. 15% is considered a generous tip. Moving - Tipping is optional (but often expected depending on the amount of work). Food delivery - Tip ₪5. The business days are Sunday through Friday in Jewish towns, allowing for observance of the Sabbath ("Shabbat") from sundown on Friday until nightfall on Saturday. On Friday, many shops will close at about 14:30-15:00 to allow ample time return home before sundown. Many shops, especially in malls, will re-open on Saturday evening, at about 19:00 in winter, and 20:30 in summer. Some shops, especially outside city limits or in tourist areas, as well as 24-hour convenience stores, remain open on Saturdays. In Arab towns, shops are generally open 7 days a week. Remember that shop opening hours depend on how religious an area is. In religious areas like Jerusalem, you can expect virtually all stores, restaurants and even public transportation to be shut down on the Sabbath. On the other hand, stores will remain open oftentimes in secular cities like Tel Aviv or Eilat. Bargaining in Israel is prevalent. Unfortunately, it is sometimes difficult for foreigners to figure out when bargaining is expected and appropriate. A general guideline: Sales agents, high prices, or no displayed prices -- bargain. Anything that looks established or corporate -- don't. Although pushing through a bargain or requesting some freebies with some cellphone companies and the like often is a possibility! Bargaining in bazaars and rural markets is common yet subtle. Vigorous bargaining which is common in developing countries will likely get you nowhere and is improper. If you are given a fair price, don't bargain for sport -- it is frowned upon. In shops with displayed prices where you are not dealing with a sales agent bargaining is improper and will get you looks of bewilderment. This includes corporate shops (e.g. McDonald's), most stores in malls (without sales agents), and pretty much all businesses a tourist interacts with (with the exception of travel agents): accommodation, transportation, food (including food stands in markets). Some entertainment venues and most activity operators (especially extreme sports) can give you quite a sizable discount if you only ask. When buying larger items (e.g. electronics), it's often possible to get a discount of about 3% for paying in cash, and additional discount depending on your haggling abilities. Since the online coupon craze started in 2010, many businesses have stopped publishing real prices, and you can get a completely different price simply by asking for a discount ("yesh hanacha?" - "Is there a discount?") or bringing in a coupon you found on an online coupon site. It's not unusual to get lower prices by up to 50%. Israeli cuisine is as diverse as the population which makes up this gastronomic country. Food here is generally of a very high standard, and immigrants from around the world mean that almost every genre and type of food is available. Not tipping in sit-in restaurants that have waiters is frowned upon, but is accepted for signalling atrocious service. It is standard to give 10%-15% (or more for exceptional service). 20% tip is considered generous. Including a service charge in the bill is no longer legal in Israel and should not be paid. In recent years, restaurants have been charging a "security fee" - roughly ₪1-2 per person. However, this fee is not mandatory, and it is common to ask for the fee to be removed from the bill, as well you should. Most restaurants accept credit cards, but do not accept personal checks. If you wish to include the tip in your credit card charge, state this before paying. Not all restaurants accept tips on credit cards. Falafel was officially adopted as the national food. These are small fried balls of mashed chickpeas, usually served inside a pita bread with hummus-chips-salat (hummus, French fries and vegetable salad) and tehina. A selection of more salads is usually available, and you can fill your pita with as much as it can take. This is usually the cheapest lunch available (₪10-15), and it's also vegan. You can also order half a serving ("kha-TSEE mah-NAH"). You can also have the same in lafa, which is basically a bigger pita. Falafel in lafa usally cost between ₪12-20. Hummus, a cream of chickpeas, tehina, lemon and olive oil, is also served on a plate, and scooped up with small pieces of pita. At places that specialize in Hummus, you can find the dish topped with cheakpeas, mushrooms, minced meat, fava beans and many other different toppings. Another street food gaining popularity is the Iraqi-origin sabich, a pita bread stuffed with a hard boiled egg, batter-dipped deep fried eggplant, hummus, tehina, and salad. The Hebrew word Kasher (כָּשֵר), pronounced by East-European Jews as Kosher, means "fit" (in Israel, gyms are known as kheder kosher, i.e. fitness room). When associated with food, it means anything that is allowed by the Jewish religious laws concerning food. These laws are quite complex, but the short version is that they totally forbid certain products (such as pork and shellfish), and allow others only under restrictions - most importantly, that meat and dairy products are not to be cooked together or eaten at the same meal, which bans all sorts of Western staples like cheeseburgers and pizzas with meat toppings. In addition, lighting a fire on Shabbat is forbidden, so only cold or long-simmered food is allowed. Having said this, due to the secular nature of much of Israel, many foods can be found, and many restaurants aren't kosher depending on the region. Kosher laws do not usually apply to Arab areas of Israel (unless they cater to mixed clientele), although Halal dietary laws (the Muslim analog) do. Most of the hotels in Israel are Kosher, so breakfast is dairy, and during lunch and dinner you'll not be able to get milk for your coffee or butter for your bread (although soy milk and spread are common substitutes). Most big supermarkets sell only Kosher products, but more and more non-Kosher supermarkets and convenience stores have appeared in recent years, due in part to the huge numbers of secular Jews who have come to Israel from the former USSR. With restaurants, things are more complicated: in Tel-Aviv, there are fewer kosher restaurants than in more religious cities like Jerusalem. In Jerusalem, on the other hand, Kosher cafes and restaurants are much more common. Bear in mind that restaurants that remain open on Shabbat cannot receive Kosher certification, so some restaurants that do not carry a Kosher certification are nevertheless kosher as far as the food is concerned, and could have kosher kitchens. So if you care, you shouldn't assume anything and always ask. Where restaurants are kosher, they will either be dairy or meat. Dairy restaurants are useful for vegetarian tourists, but still are likely to serve fish and egg products. One pitfall with finding kosher food is that some con-men have found they can make money by setting up business selling fake kushrut certificates. Therefore someone looking for kosher food should look for a certificate from the local rabbinat or a recognized kashrut agency . Certificates from unknown organizations  should not be relied upon. Vegetarians/Vegans should have a relatively easy time eating in Israel since Israel is home to approximately 320,000 vegans, the highest per capita vegan population in the world. Due to "kashrut" (the rules of keeping kosher) there are many restaurants that serve only dairy food, which makes them popular with vegetarians. In some parts of the country you can also find Vegan restaurants. Amirim is a vegetarian/vegan village in the Galilee with several restaurants. Many Israelis like instant coffee and will order it in restaurants and shops. However, in the past two decades a café culture has developed throughout Israel, with standards equivalent to coffee shops in Europe. Israelis hold North American filtered coffee in low regard, and Starbucks failed in Israel due to its coffee being considered inferior by most Israelis. A popular way to brew coffee is known as "botz" (mud) coffee (also known as "cafe turki" or Turkish coffee), an inexpensive extra-finely ground coffee that is cooked on a stove and served unfiltered/unstrained, often spiced with cardamom. There are several highly popular local coffee chains and numerous independent coffee shops. Israelis seem to have a preference for "cafe hafuch" (Cafe latté; lit. "upside-down"), but good espresso and various other brews are ubiquitous. You can also have a light meal with sandwiches and salads in most cafés. Aroma is Israel's largest coffee chain that has good coffee. You can order sandwiches there in three sizes and choose from three types of bread. Arcaffé is slightly more expensive, but their coffee (some say) is better. Other chains include Elite cafe, cafe cafe, Coffee Bean & Tea Leaf, and Cafe Hillel (of which some branches are Kosher dairy). Those who are used to Starbucks-like coffee or even Italian espresso may be impressed. The drinking age in Israel is 18. Goldstar — a Munich-style dark draught, it is the most popular Israeli beer in Israel. Can be found in bottles and cans of 0.5 and 0.3 liters (1 pint and half a pint, respectively), or KHE-tsi and shlish (Hebrew for "half" and "third". Referring to the amount based on litres, as Israel uses SI). It is also available from tap (meh ha-kha-VIT, Hebrew for "from the barrel"). Maccabee — a pilsener, lighter and smoother than Goldstar. Comes in bottles, cans or from tap. This beer has a bad reputation in Israel as being of foul taste. Recently, its recipe was changed and the beer has been regaining popularity in Israel. Still, due to its bad reputation many bars do not serve it. Be aware that the local variety of Maccabee tastes differently than the exported one. Taybeh  — made in the first micro-brewery in the Middle East, "Taybeh Beer Brewery" is from Taybeh village, a short taxi ride distance from Ramallah, an extremely fresh and delicious beer that is popular with many Palestinians, Israelis and tourists alike. It is mainly found in Israeli Arab communities, Jerusalem, and Palestinian cities. Taybeh Brewery offers free tours of the facilities and has ₪5 beers for sale at the brewery. Taybeh village also hosts it's very own Oktoberfest-style beer festival held annually during the first week of October. The festival well-attended with foreign tourists and is growing in popularity. Lately, several brands of micro-breweries have established themselves, and a wide selection of bee rott boo teek (boutique beers) such as Bazelet, Golda, Laughing Buddha, Asif, Dancing Camel and many others can be found in selected alcohol houses and in some chain retail stores. In addition, a wide variety of international brands are available throughout Israel, some of which are locally brewed. Among the most popular are Heineken, Carlsberg, and Tuborg. Most of the regular western sodas are available, and many have local variants that aren't very different in taste. Pepsico, The Coca-Cola Company and even RC Cola fight for the soft drinks market aggressively. Israeli Coca-Cola is thought by Cola connoisseurs to be tastier and more authentic than elsewhere. This is due to the fact that Israeli Coca-Cola is made with sugar, and not with high-fructose corn syrup. Tempo (not to be confused with Tempo Industries, Ltd. which is the brewer of most Israeli beer and bottler of most soft drinks including the local Pepsi) and Super Drink are dirt-cheap local variants, at times sporting very weird tastes. The generic name for Coke or Pepsi is "Cola", and it usually implies Coca Cola; if the place serves Pepsi, they will usually ask if it's fine. Also note that "Soda" generally means "Soda Water", and is not a generic name for carbonated soft drinks. Tropit — cheap fruit flavour drink which is usually grape. Comes in a tough aluminum-like bag with a straw. The bag is poked using the straw to make a hole through which you drink. A very portable drink (until holed), which has become very popular in summer camps. In the newer varieties there is a marked area where the straw should be inserted. Even then it can sometimes take practice to insert the straw without the juice squirting out. It is just like the Israeli version of "Capri Sun." Spring Nectar — fruit flavored drinks that comes in cans or 1.5L bottles. Sold in most supermarkets, convenience stores and petrol stations, as well as many take-away stands. Comes in a number of flavors such as peach, mango, and strawberry. Prigat — fruit flavored drink that comes in plastic bottles. Is sold at pretty much every supermarket, petrol station and corner-store around Israel. Comes in many flavors including grape, orange, apple, tomato and a few more exotic options as well. Primor — fruit juice in plastic bottles. Sold pretty much everywhere. Comes in many flavors, mostly citrus and apples. Israel is host to a huge variety of accommodation options, from camping and hostels to 5-star luxury hotels. Accommodation in Israel is similar to Western standards in general both in terms of price and what you can expect as service. Hotels in Israel do not currently possess star ratings, so beware that where these are seen, they are awarded by the hotels themselves. A good way of finding good hotels in Israel is by looking through reviews on websites such as Tripadvisor, although the links below act as good starting points. The Israel Hotel Association (IHA)  is the umbrella organization for Israel's hotels and also represents them. About 350 hotels, from Metulla in the North to Eilat in the South, are members of the IHA. Israel Youth Hostel Association  runs a thriving network of youth hostels. ILH - Israel Hostels  a network of 40 independent hostels, guesthouses and lodges designed for independent travelers. A large number of kibbutzim  now include bed and breakfast accommodation amongst their activities. Israel has many universities which tend to be well regarded by the international community. Special programs for students from abroad are offered by the Rothberg International School at the Hebrew University in Jerusalem, the Lowy School for Overseas Students at Tel-Aviv University and the Ginsburg-Ingerman Center for International Student Programs at the Ben-Gurion University of the Negev Beer Sheva. The Technion in Haifa also has an international program, specializing in engineering. There are even ways to learn Hebrew online from outside Israel - try Home Ulpan , or Virtual Ulpan , if you want some basic background for free. A good starting point for finding more information on study and volunteering programs, can be found on the website of the World Zionist Organization . If you are interested in learning firsthand about the social, political and cultural aspects of life in Israel, there are several programs and organizations offering courses, workshops or learning tours, such as: The All Nations Cafe  in the Jerusalem - Bethlehem area. While working on a tourist visa is illegal, if you stay at any cheaper hotel in Tel Aviv or Jerusalem, the staff may offer to put you in contact with opportunities to wash dishes or work in construction. Pay is only around $7 an hour, and if caught, you can expect to be deported and blacklisted from the country for a period of no longer than one year. When there is no fighting between Israel and Palestinian militants, travel to Israel is relatively safe, and most other crime rates are well below those found in most other Western Countries. Having said this, buses and bus-stops have been targeted by Palestinian terrorist groups since the early 1990s. Although statistically, the chances of being involved in a traffic accident are much higher than the chances of being involved in an attack. It is still a good idea to stay informed of developments before and during your stay. Caution should be used particularly in the disputed areas. If you see anyone acting suspiciously, or find an untended parcel, notify the Police. Also, never leave a bag unattended in a public area, as it may be suspected as a bomb. Policemen in Israel wear light blue or very dark navy clothing with flat caps, while Israeli Border Guards (similar in function to Gendarmerie) wear dark grey uniform with green berets or police ball caps. It is not unusual to see plenty of soldiers (and sometimes civilians) carrying firearms (military rifles and handguns) in public. Most of these soldiers are simply on leave from their base. Soldiers have no authority over civilians, except in specially designated zones near borders or military bases, where they are allowed to detain you until the arrival of a police officer. It is very common (even required by law) to see private armed security guards at every public doorway (for malls, stores, restaurants, etc). The guards ask to look in your bags and may use a metal-detector on your person. When entering underground parking lots, the trunk of your car will be inspected. Do not be alarmed as this is just national policy. If you carry huge backpacks, you can often get away with showing a passport, and the guards will be just as relieved. In terms of typical crime, Israel is a very safe country. Israel has one of the lowest crime rates in the world. You can walk around the cities and towns at night without fear, as mugging and drunken violence are rare. Single women, in particular, should still take care late at night but the risks here are far lower than practically anywhere in Europe and America. Organized criminal activity is endemic in major Israeli cities, but poses no threat to tourists. Crime bosses have violently fought disputes out in public, but rarely have civilians been affected. Israel's relations with its neighbors should always be something that a traveler should be familiar with, as evidenced by the Israeli-Lebanese conflict of 2006. Despite the current cease-fire, there remains a very low danger that the conflict will again erupt. Israel has very good relations with both Egypt and Jordan, whom Israel signed a peace treaty with, in 1979 and 1994, respectively. Although a cease-fire has been reached between Israel and Hamas, travel to the Gaza Strip area is not recommended at this time, and several noted foreigners (even volunteers) have been kidnapped by armed militants. Also, Israel does NOT allow travel to the strip, the only way is via Egypt. Southern Israel desert region offers amazing hiking trails in a beautiful landscape that possesses some unique geographical features not available anywhere else in the world. However, if you are inexperienced in hiking in the desert, do not hike there without an experienced hiker, proper equipment and clothes, plenty of water, and taking the necessary precautions. Dehydration in hot days, hypothermia in cold nights, and flash floods in rainy days are serious dangers! Hiking trails in southern Israel (and in the Golan) are adjacent to military fire practice areas. If you are not certain where you are going, do not hike in this region. In a similar note, especially near border areas, hiking or leaving the roadways, be aware of standing and/or fallen fences with a sign (yellow with a red triangle on it). These areas are considered off limits due to the possibility of landmines being present. Planted by the Turks, British, Vichy French, Druze, Israelis, Lebanese army, Lebanese Militias, PLO, or the Syrians (Golan Heights, Lebanese border). It could take another 100 years to clear out all those areas. Unlike many parts of the Middle East, Israel is one of the most "gay friendly" countries in the world. In fact, Israel is quite progressive regarding homosexual rights. Criticisms towards homosexuality will vary depending on where one travels, but otherwise, this country is considered safe for gays and lesbians, as violence against them has rarely occurred here. All 3 major cities (Jerusalem, Tel Aviv and Haifa) have an annual "Pride" parade, and the annual Love Parade in Tel Aviv gets cheering spectators too. In case of an emergency, don't bother searching for the right number to call - you will be redirected by the dispatcher if you got it wrong. Please note that many parts of Israel are considered sacred for Jews, Christians, and Muslims. When travelling to Holy Sites, or going through religious neighborhoods or towns, ensure that you are tolerant of the local customs and dress codes. Also be aware that in Holy Sites women should dress in modest clothing to respect the sanctity of the site. Israelis sometimes compare themselves to the prickly pear or sabra: said to be tough and prickly on the outside yet sweet and soft on the inside. Israelis are direct in a way that might seem abrupt, even rude, in other parts of the world. Do not be offended by this as Israelis do not mean to insult or offend in any way. Directness and honesty are often valued over politeness and projection of niceness. Direct personal questions are common, and should not be taken as offensive. But Israelis are also very kind and hospitable. Strangers will gladly assist you, and make great efforts to help a lost or inquiring tourists, sometimes over-whelming you with advice and questions. When you make a friend here, they will do their best to take care of you while you're in their country. Foreign visitors are deeply appreciated and are generally shown the utmost respect by locals. Many will even go as far as to show you around some areas in Israel as a sign of their own national pride and towards respect for tourists. While traveling in Israel, visitors will discover that Israelis have, in general, a western-oriented outlook with a Middle Eastern touch. The population is laid-back, outgoing, and always willing to help. Some tourists may even feel that Israelis are overbearing, since their definition of personal space is much different from that in the west. However, it is extremely important to realize that some parts of Israel follow a strict code of respect based on religious law and custom. Jewish holy sites in Israel are generally divided into sections based on gender. This is most obvious at the Western Wall, where the wall is separated into mens and womens sections. In addition to gender separation, modest attire is required at holy sites. While men could wear whatever they want, women should wear a knee-length skirt and a t-shirt with sleeves. Jewish men, and in some instances non-Jewish men, should wear a head covering at holy sites. It is also customary, though not required, for married women to cover their hair. Visitors should also be aware of their behavior on the Sabbath and all religious holidays. Those at holy sites during these times should refrain from smoking, using their cell phones, taking pictures, or disturbing the serenity of the day in other ways. The religious commuity takes these days very seriously, as they receive a lot of joy from them. Tourists may even want to live a day in the life, and experience these sites according to the local custom. While the sites most holy to Muslims are in Saudi Arabia, Israel is full of sites sacred to the followers of Islam. In addition, many neighborhoods, especially in the north of Israel, have a Muslim majority. As such, tourists should be sensitive to acting and dressing in a modest way. When entering Muslim holy sites, women should ensure to not wear tight or revealing clothing, and have a scarf with which to cover their hair. Men should also not wear tight or revealing clothing, and should be prepared to take off their shoes. Most Christian holy sites are located in the north or in Jerusalem. Especially in churches, respect should be paid to worshipers who expect a quiet, serene atmosphere. Along with a modest dress code, tourists should understand the photography is frowned upon, and in some instances not allowed. Candles are available for lighting for prayers and religious observance, and should not be disturbed. The modern state of Israel was founded in the wake of one of the biggest tragedies to befall the Jewish people. Many survivors of that harrowing experience made their way to Palestine, as it was then known, via British DP camps. While survivors, their children and grandchildren, and all other Jews affected by The Holocaust talk about it to varying degrees, tourists should not press the issue. In addition, making jokes about The Holocaust will be considered EXTREMELY disrespectful and in the WORST possible taste. Israel is full of great stories, and an amazing museum, but all travelers should be respectful. Israelis, both Arab and Jewish, will often speak openly about current events, and sometimes without prompting. There are views along the entire spectrum, from the far right Israeli settler movement to Arab nationalists, which can provide visitors with many colorful views. However, travelers should be sure to listen more than they speak. Israelis and Palestinians can be defensive, and often think that their opinion is the right opinion. Keep conversation about the conflict light, and take cues from the locals. If you want to phone home from Israel, you need to choose which company you want to use for your international call first. The '00' access code for international numbers is available only on phone lines that chose, in advance, one of the long distance carriers as their preferred provider (so it's not available on pay phones). Note that the 018 prefix is a VOIP operator. Thus, it has the cheapest rate but a somewhat lower line quality. If you have a cellphone without a SIM-lock, you can buy a SIM-card which is much cheaper than either renting or buying a phone. Be sure to check the compatibility of your device to the Israeli networks. Prepaid SIM cards are available from Pelephone (Talk & Go), Cellcom (Talk Man), Partner (bigtalk), 019 Mobile and Hot Mobile (HoTalk). You can find them everywhere in shopping malls, kiosks, other shops (like book, office supply, electronics stores etc) and at the post office (not every place carries all providers). 30 days 3000 min voice + 3000 texts + 5GB/9GB - 59₪/79₪. Unlimited voice and text + 10GB/14GB - 139₪/159₪. Data only: 5GB - 99₪, 10GB - 129₪, 25GB - 149₪. 7 days Unlimited Voice and text + 1Gb - 50₪, 30 days Unlimited Voice and text 10GB/14GB - 140₪/160₪. Data only: 1GB - 59₪, 3GB - 79₪, 5GB - 99₪, Unlimited - 149₪. 7 days 1000 min voice + 1000 texts + 2GB - 39₪, 30 days 3000 min voice + 3000 texts + 5Gb/8GB/10GB/15GB - 49₪/69₪/99₪/129₪. Data Only: 6GB - 49₪, 18GB - 140₪. The fifth carrier, called Golan Telecom, the mentioned other 4 carriers (Pelephone, Cellcom, Partner and Hot Mobile)and the MVNO operators (Virtual networks) like Rami Levy, 012 Mobile or 019 Mobile also offers great monthly packages without a long-term contract (you can cancel at any time without any fine). You will need to leave a billing method (credit card or a local bank account) and formally ask to cancel the line after you leave. Golan Telecom and 012 Mobile offer you the option to purchase the SIM card in a local 'point of sale' and activate the subscription via their website (however, 012's website is Hebrew only). For Golan Telecom you can see a list of 'point of sales' on their website, and as for 012 Mobile any Yellow convenience store (which are open 24/6 or 24/7) or Ivory branch can sell you a SIM. 39.90₪ for 5000 min voice + 5000 text + 100GB + 500 min for overseas calls to landlines - US and Canada Landlines and cellphones (012 Mobile). 29.90₪ for unlimited voice and text + 30 GB (Golan Telecom). Currently Israel offers support for all the available networks including GSM/UMTS (Pelephone, Cellcom, Orange, Golan Telecom, Hot Mobile and the resellers), and CDMA (Pelephone). In any case, you must check with you carrier the roaming option and the compatibility of your device in advance. All operators support 2100mhz 3G/UMTS bands with some still offering 850mhz and 900mhz support as well. In 2014, 4G/LTE started being deployed in Israel and operates in FDD on band 3 (1800mhz). As of 2018, it is available in most populated areas of the country. Typical speeds are 15-80mb/s down and up to 30mb/s up. There are still some public pay-phones scattered around, usually lacking a booth (just a phone on a pole). These phones use a Telecart, which , today, is a pre-paid calling card (the scratch kind) that works only with pay phones and can be purchased at post offices and some stores (the original Telecard was phased out as the last factory that manufactured it was shut down), as well as ordinary calling cards. Some phones also accept credit cards, but they are very rare. In Jerusalem especially and in more Jewish-religious areas you will find public phones to be very common, as the more religious Jews tend to frown on the new mobiles with Internet access etc, resulting in a situation whereby every person with a mobile is automatically assumed to be on the Internet 24/7. Israel is a technologically advanced society, and internet cafés are widely available in most cities and towns. The regular price for paid internet cafés is about ₪15 per hour but you can get it for about ₪10 in some of the more local places. Free wi-fi access is common in cafés (check individual articles). All branches of 'Aroma Espresso Bar', 'Arcaffe', 'Café Café', 'McDonalds' and 'Yellow' convenience stores have free wi-fi access, though in some you will have to approach the staff for a password. Recently, the "Jerusalem WiFi" project started. This government started project aims to cover the entire Jerusalem area with WiFi although at the moment the only areas covered are in the city center. A similar project has succeeded in Tel Aviv and in the beach of Rishon Letsion. In fact, in 2014 Tel aviv was dubbed the 'world smartest city' award in the smart city expo congress. This page was last edited on 1 April 2019, at 07:56.